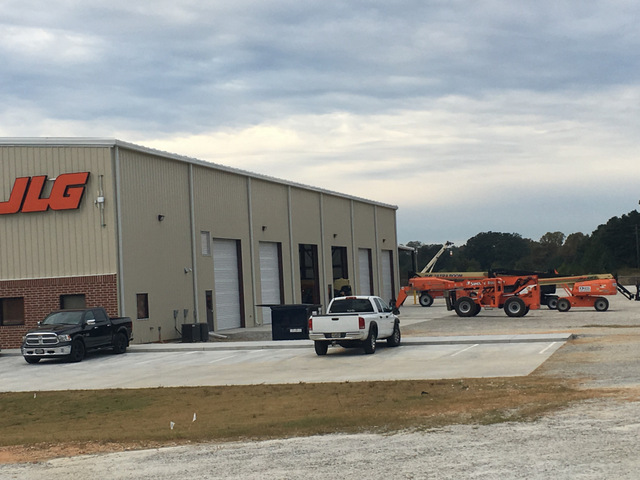 JLG Industries Inc., an Oshkosh Corporation company and a leading global manufacturer of aerial work platforms and telehandlers, recently opened a new service center in Hiram, Georgia. The 14,400-square-foot, eight-bay Atlanta-area facility joins the growing list of JLG service centers that includes facilities in Houston, Texas; Riverside, California; Hagerstown, Maryland; and the Rock Hill, South Carolina opened last year. The new center will inspect, maintain, and repair all brands of lift and access equipment at the facility or on location at a customer’s job site. The list of services includes quarterly and annual ANSI-required mobile elevating work platform (MEWP) inspections, preventive and planned maintenance, light and heavy repairs, and mobile service for customers who preference on-site service of their equipment. In addition to its twelve service bays, the Atlanta-area service center includes a wash bay, four ten-ton overhead cranes and fully-equipped mobile service vehicles. The center sits on seven acres of land that includes 4.4 acres of on-site equipment storage. As part of its ongoing commitment to support its customer base, in addition to its company service centers, JLG has a network of service provider partners throughout North America. For more info on JLG, click this link. We even made it JLG orange.